Voyage on the National Mall in Washington, DC, with the Sun and inner Solar System located on the east side of the National Air and Space Museum. You’re looking westward, with Jupiter and Saturn located to either side of the Museum’s main entrance down the street. 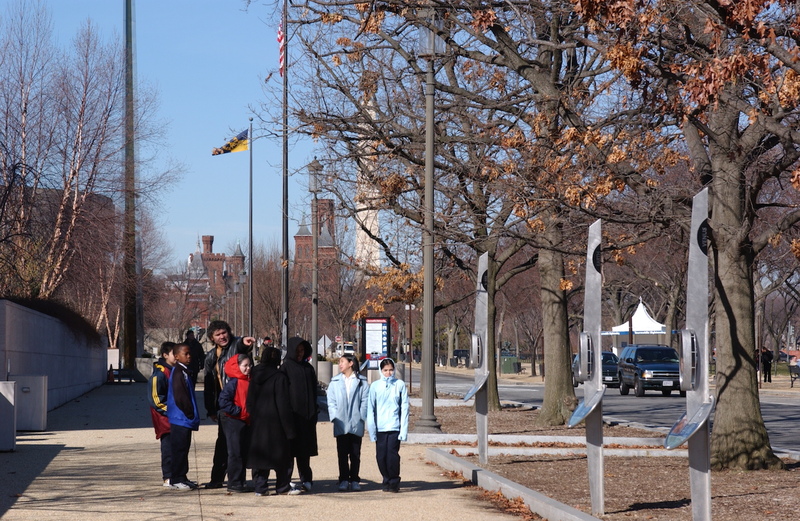 The dwarf planet Pluto is found 2,000 feet (600 m) from the Sun, near the Smithsonian Castle Building. Beyond is the Washington Monument. Continue walking and you’ll eventually reach the California coast. 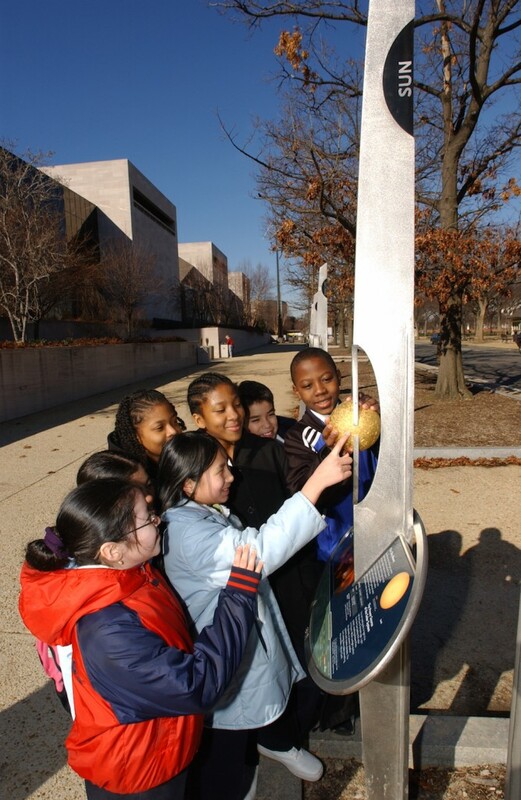 In October 2001 a 1 to 10-billion scale model of the Solar System was permanently installed on the National Mall in Washington, DC, between the U.S. Capitol and Washington Monument. Appropriately called Voyage, it allows visitors to leave our Earth and gain a profound conceptual understanding of humanity’s place in a greater space. 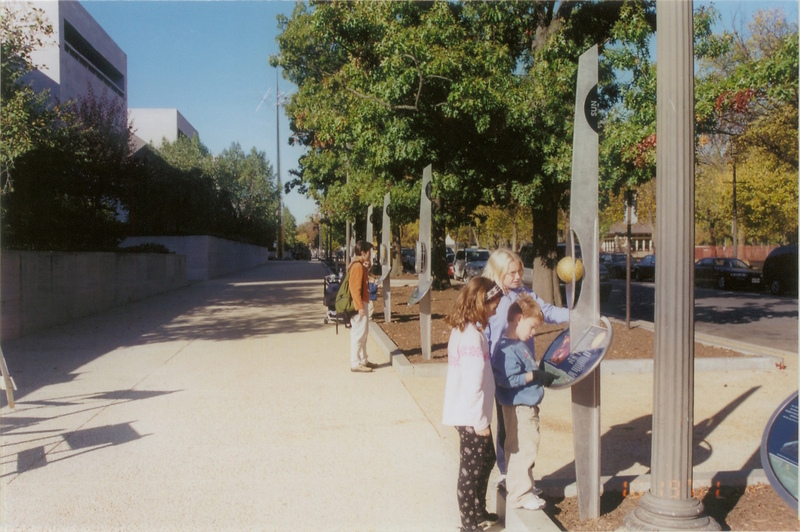 Comprised of 13 stanchions, Voyage is installed along Jefferson Drive, and extends 2,000 feet – a comfortable 10-minute walk – from the model Sun located on the east side of the Smithsonian National Air and Space Museum to the dwarf planet Pluto located at the Smithsonian Castle Building. Voyage is an accurate model of the Solar System at one ten-billionth actual size. More formally stated, Voyage is a ‘1 to 10-billion scale model’ of the Solar System, where all dimensions depicted – whether it’s the diameters of the Sun, planets, and moons, or the distances between worlds – are one ten-billionth actually size. On this scale, the model Sun is the size of a large grapefruit, with a diameter of 13.9 cm (5.47 inches). The choice of a 1 to 10-billion scale is based on an assessment of the core learning objectives for the visitor experience, and to maximize a recognition that the Solar System is comprised of tiny worlds in a vast space. The exhibition is indeed designed as a voyage that will forever change your perspective of home. For a physical model of anything to be a good learning tool, it needs to be contstructed about the size of a human, so that the learner can manipulate it and explore the real thing as a model. Think of a globe of the Earth, or a model of DNA in a classroom. These physical models are built about our size – close to the size of a human – so we can hold them, manipulate them, and efficiently and effectively explore the information contained in the model. Using a globe of the Earth we can explore the shapes of the continents and oceans, and the locations of national borders, mountain ranges, rivers, and cities. But the Solar System poses a significant problem for the modeler because the distances between worlds are vast compared to the size of the worlds. The best approach is for the size of the learner – the size of a human – to be mid-way between the size of the smallest worlds depicted, and the largest distances depicted. So mid-way between the size of the Moons that have a true diameter of 1,000 km (600 miles) and the sun-Pluto distance of nearly 6 billion kilometers. The National Mall in Washington DC, as photographed from Low Earth Orbit. When walking from the US Capitol to the Washington Monument you are moving due west. To view this image at high resolution, first click on it, wait for it to load, then click on the ‘expand’ button located in the image’s upper right corner. Once done, click on the ‘expand’ button again to return to the normal image size. The site map for Voyage on the National Mall, providing the location of the exhibition’s 13 stanchions relative to local landmarks. Click on the image to zoom. 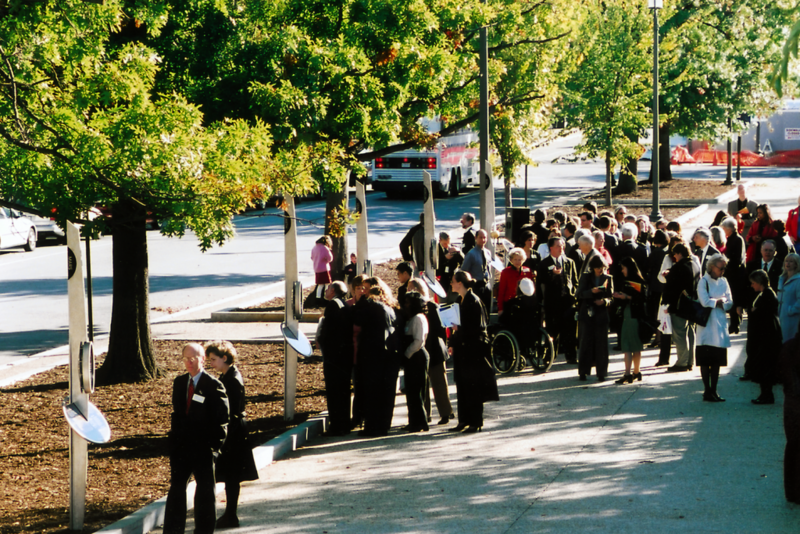 Imagine leaving the grapefruit-sized Sun walking westward toward the Washington Monument. After walking just 50 feet (15 m) you encounter Earth, home of the human race, and smaller than the head of a pin. The entire orbit of the Moon fits comfortably in the palm of your hand. The 50-foot distance between the Earth and Sun represents 17 years of travel at the speed of a commercial jet. After a comfortable 20-minute walk, stopping along the way to visit a number of other worlds, you arrive at the Smithsonian Castle Building, 6.5 football fields west of the model Sun (2000 ft or 600 m). Here, just visible, is tiny Pluto—far smaller than the head of a pin. Looking back at the model Sun, across over 6 football fields of empty space, you realize that Earth is no more than a small speck of dust orbiting close to the Sun. How does the human race even know Pluto exists? If you could continue your walk westward, you wouldn’t find the nearest star to our Sun—Proxima Centauri—until you had reached the California coast. The Sun and Proxima Centauri are just two stars in our home ‘city of stars’—the Milky Way galaxy. The Milky Way, an insignificant plot of real estate in the greater universe, contains enough stars to give 50 to every human being on Earth. How insignificant is the Milky Way? It is only one of over 100,000,000,000 galaxies in the observable universe. Light, the fastest thing in the universe, can circle the Earth 7.5 times in one second, traveling 40,000 times faster than the space shuttle. The speed of light on the scale of Voyage is 1 inch per second (2.5 cm/sec), about the speed of a fast ant. Leaving the model Sun an ant would arrive at the model Earth in eight minutes, Pluto in 6 hours, and a model Proxima Centauri in California after 4.5 years. Put another way—exploring just the space between the Sun and nearest star to the Sun at the fantastic speed of light, would be like exploring the continental United States as a colony of ants. This is the story of our existence–a race of explorers, 6 billion tiny souls strong. It is a story that ignites wonder about the universe, and a sense of pride in our ability to reveal its nature through both human imagination and ingenuity. It is a story that humbles us, and brings a sense of humility to our lives. It is a Voyage that will forever change your perspective of home.